Jeroen Minnema of Ocean Independence in Antibes contacts me to say that he's signed two Sanlorenzo megayachts for sale. The first, the 24m Alpha Papa, was delivered in 2005 and has had the same owner since new. 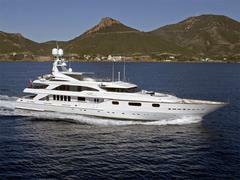 Never chartered, she sleeps eight guests in four cabins and is offered at €2.5 million, VAT paid. Then there's the 26.75m Sparkling, built in 2002 and again used only privately and sleeping eight guests in four cabins. Currently available to view in Monaco, she's asking €3.3 million VAT paid.